Another spotlight, and we have more in the works! Today, we have electronic rock and roll band Evol Walks! 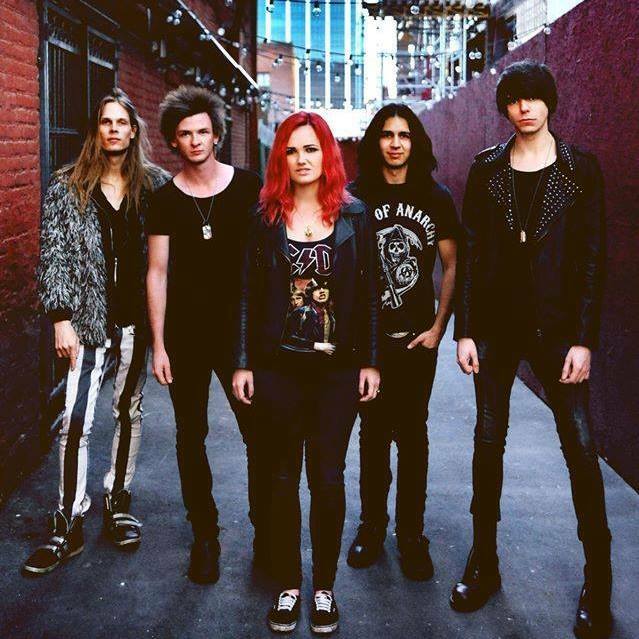 Fronted by Leah Martin-Brown, the band was formed originally in Australia, but was restructured when Leah made the decision to move out to Los Angeles in 2014. “I ended up re-branding my old band, essentially starting from scratch and began searching for other musicians to help build the new project (now called Evol Walks),” she stated. Now the band consists of Leah, CT Twywoniak (lead guitar), Dre DiMura (rhythm guitar), Ian Ross (bass), and Jimmy Lee (drums). Leah herself started playing and performing music when she was seven or eight years old, and fell in love. “I always knew that it was what I wanted to do with my life,” she said. “There were never any other avenues I was interested in pursuing seriously.” Hailing from Gold Coast, Australia (“a major tourist hotspot,” she noted). had an impact on her and eventually the band’s music. “Growing up there, you see a lot of people living this crazy, high intensity, party lifestyle,” Leah said of her home, calling it the Las Vegas of Australia. “I think that made an impression on me as a lot of our songs are about wild nights out on the town. Inspired by bands like AC/DC, Led Zeppelin, Monster Magnet and Black Sabbath, as well as Janis Joplin, Grace Slick, Stevie Nicks Joan Jett, and Amy Lee, Leah and the band give off high energy and attitude, while still creating and performing amazing music! Evol Walks has shared the stage with great bands like the Red Hot Chili Peppers, The Killers and Dead Letter Circus and supported the likes of Everclear and The Presidents of The United States of America. One of Evol Walks’ most recent tracks, “Without Me,” features not only Leah’s stand-out vocals, but the musical chemistry of the band overall. Leah used an ex from Australia as inspiration for the song. “We drifted apart and I ended up being with someone else and my ex couldn’t understand what had happened and why and just refused to let go,” she admitted. “The song was my gentle way of telling him how I felt and that he needed to move on.” Check out the track below! Be sure to check out more from the band on their official website as well as SoundCloud and Reverb Nation. You can also follow them on Facebook, Twitter, and Instagram!